Twitter just celebrated its 10th anniversary this year. Despite the years, users are still finding clever ways to use the social media tool. Recently, The Netherlands Board of Tourism and Conventions turned to Expedia Media Solutions, the advertising arm of Expedia, Inc., to raise awareness of Holland with travelers. Using Twitter, Expedia came up with a campaign tied to one of the country’s most famous painters and one of the world’s best impressionists. 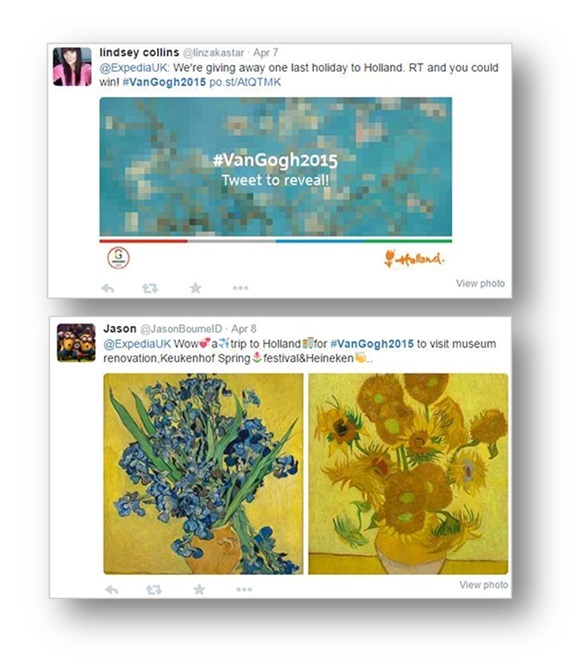 The team challenged consumers to collaboratively tweet and retweet a #VanGogh2015 hashtag to earn brush strokes that would reveal one famous Van Gogh work of art each week, with the chance to win a trip for two to Holland. The campaign generated more than two million impressions and drove double-digit growth in Holland’s visitor demand.